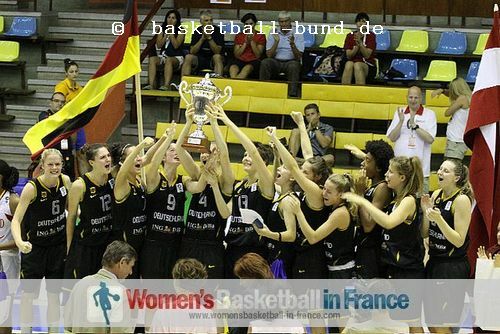 Germany maintained their perfect record at the 2011 FIBA Europe U16 European Championships for Women Division B competition to lift the winner's trophy. In addition Emma Stach and Noémie Rouault picked up individual awards as members of the all-tournament team. 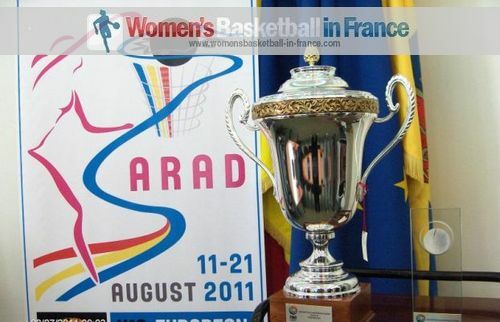 Borislava Hristova from Bulgaria was elected the Most Value Player in the competition. She was the top scorer with 25 points and also played the most minutes. In eight games out of nine she scored 21 points or more while her lowest score was 16 points. However her 28 points in the bronze medal match was not enough to deny Latvia from winning the match. Latvia needed six minutes to find their way. They ended their first quarter with 9 unanswered points (20-11) to conclude the 13-0 sequence early in the second quarter. Latvia maintained a double-digit lead all the way through the quarter to go into the half-time break with a comfortable advantage (38-22). Hristova (right) went on the attack during the third quarter scoring 16 points for Bulgaria. But Latvia had Katrina Kate Visnevica (19 points) and Kitija Laksa (18 points) firing on all cylinders. Latvia increased their advantage slightly going into the final quarter (60-42) and then cruised to the bronze medal (84-52). Germany scored first from the free-throw line but found themselves trailing (1-6) after 90 seconds. Yet with just three minutes played the teams were tied (8-8). The scoring rate dropped after the blitz opening with Germany coming out on top by the end of the first quarter (20-15). The second and third quarter turned into a game of cat and mouse with England remaining close but not able to catch Germany. Despite losing the battle of the board and a high turnover count Germany led (60-56) with three minutes to play. Both sides had problems from the free-throw line. However during the last couple of minutes the free throws started to go in. With eight seconds to play Janice Monakana hit a pair for England (63-65). Karen Burton called an immediate time-out. On resumption the Germans managed to knock off some precious seconds before Noémie Rouault was fouled. Rouault missed the first but scored the second free throw. England had less than two seconds to get up the court so Leah McDerment took a couple of steps and launched the ball more in hope of some luck. England's luck was not to be and Germany won (66-63). Ama Degbeon led the German attack with 17 points. Rouault added 14 points while picking up 10 rebounds and Emma Stach scored 12 points and dished out 6 assists. For England Jay-Ann Bravo-Harriott (5 assists) scored 24 points. McDerment also dished out 5 assists while scoring 13 points and Cheridene Green was also in double digits with 12 points. The Bulgarian MVP Borislava Hristova is joined in the All-Tournament team by Shequila Joseph (England), Joana Soeiro (Portugal) and from Germany Emma Stach and Noémie Rouault. The Fair Play Award went to Israel for their sportsmanlike behaviour throughout the tournament.